Dark chocolate coconut mousse is delicious any time of day! 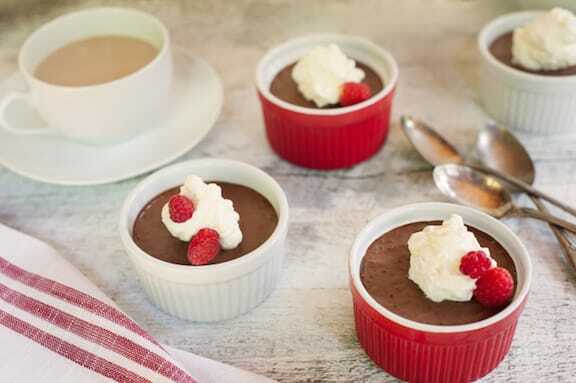 The secret to this simple and luscious 3-ingredient mousse is to thicken it up with a small amount of chia seeds, rather than arrowroot or cornstarch, which might make it lumpy. And it takes 10 minutes or less of hands-on time. Recipe by Leslie Cerier, developed for Equal Exchange with their organic dark chocolate chips. Chocolate is even more delectable when you know it’s fair trade. Photo by Tracey Eller. Dark chocolate coconut mousse is delicious anytime of day! This simple, 3 ingredient, luscious recipe was developed by Leslie Cerier for Equal Exchange with their organic dark chocolate chips. Melt the chocolate chips in a small pan on low heat stirring occasionally for a minute or 2. Add melted chocolate and chia seeds. Blend it all together. Taste and add more melted chocolate, if desired. Notes on topping options: Use a readymade vegan whipped cream or make your own if you’re feeling more ambitious; fresh raspberries or sliced strawberries go well with this too, with or without the whipped cream.